I always say that ANYONE can sew, and that goes for kids, too. This is why I love Sew a Softie, the wonderful recurring event created by Trixi from Coloured Buttons. My children and I participated in Sew a Softie last summer with a pattern and tutorial for a stuffed bone for plush puppies. 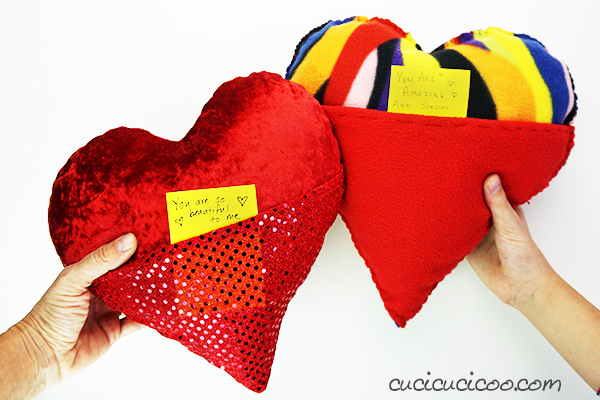 And this month we’re participating with a hand sewn plush heart pillow with a pocket for love notes! Let me tell you a bit about why this February version of Sew a Softie is so special. Trixi has teamed up with the Children’s Museum of the Arts in New York for a month-long Global Kids Sewing Party. The theme of the event, “kindness and caring,” is perfect for the month with Valentine’s Day, and participants are asked to have local sewing parties to sew a soft hand-sewn item to give to a loved one or member of the community to show kindness and caring. Isn’t that just the nicest theme possible?! 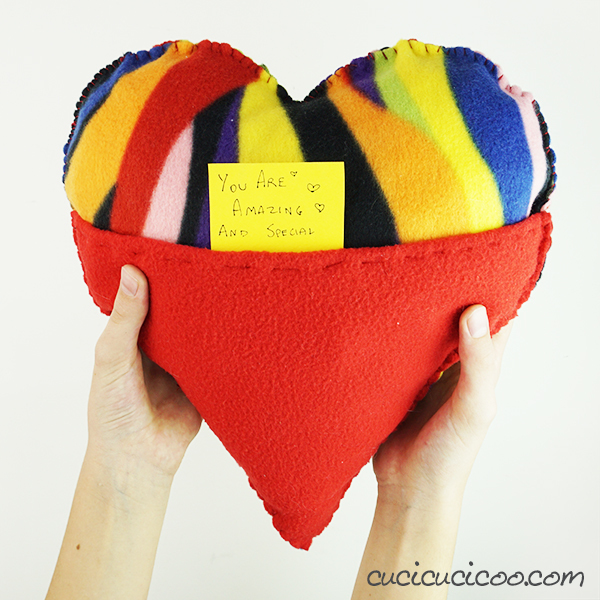 And that’s why my hand sewn plush heart pillow pattern and tutorial is a perfect project for this round of Sew a Softie! 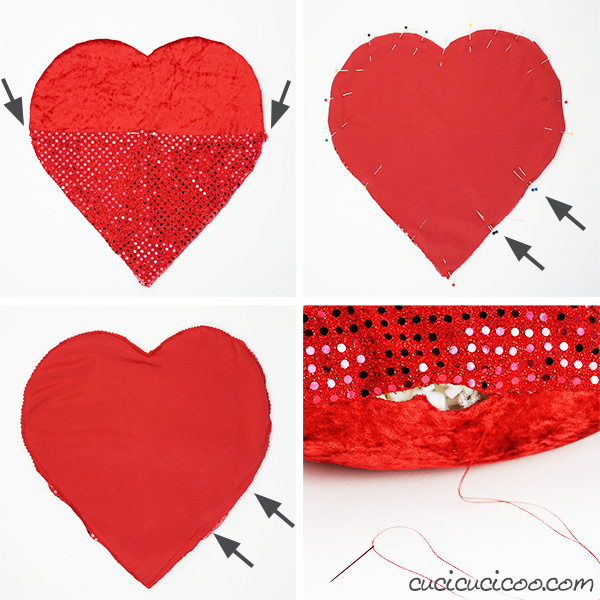 The design is easy enough for children to sew by hand (or you can sew it by machine, as I did with the sequin pillow above), the heart shape is great for Valentine’s Day, and the incorporated pocket holds thoughtful messages to express how much you care about the person you are giving it to! 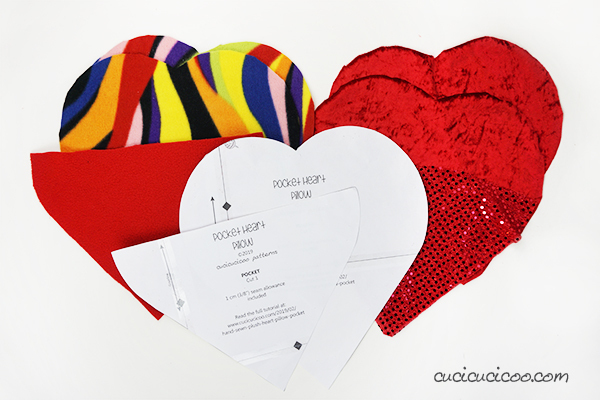 Wouldn’t receiving a love note like this one just make your day?! 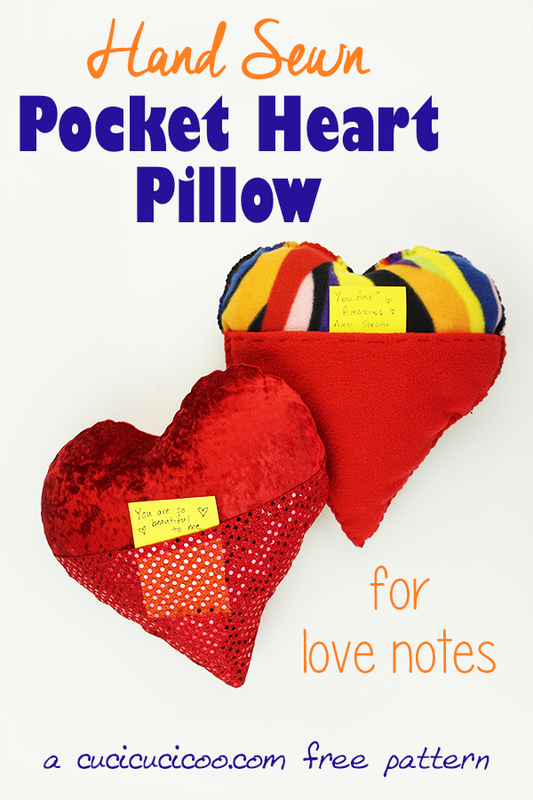 Are you ready to make your own hand sewn plush heart pillow with a pocket? Let’s get started! Fabric. I recommend that children or beginners who are hand sewing use fleece or felt, which don’t fray and are easy to cut and sew. I used a stretchy velour and faux-sequin fabric in my machine-sewed version. Fabric shears. 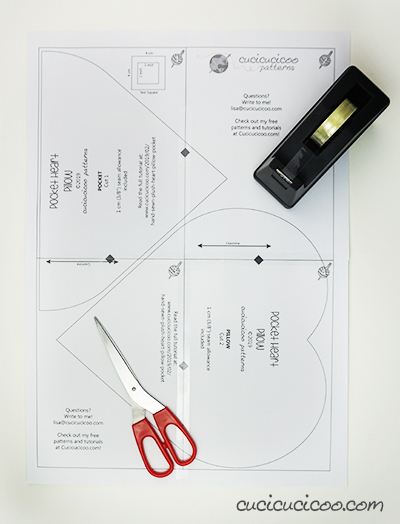 I loooove these Fiskars tabletop scissors* because they make it easy to cut around patterns. Pins. We used these Dritz ballpoint pins* that protect stretchy fabric. Embroidery floss. My daughter used 3 strands of DMC 666 embroidery floss*, but use whatever color matches your fabric best. Hand needle. We used a Pebbles embroidery needle*. Stuffing. This was the first project I stuffed with memory foam stuffing*, which makes for a super squishy pillow. If you are making your pillow with a sewing machine, you will need matching thread and a machine sewing needle, as well as a hand needle. 2. Cut out the pattern pieces, then use them to cut out the fabric. You need one pocket piece and two pillow pieces for each pillow. As I mentioned before, this project can be sewn by hand or by machine. Let me start with the easier version for beginners. 3. Thread the needle with 3 strands of embroidery floss (or more, if you prefer the more chunky look). 4. 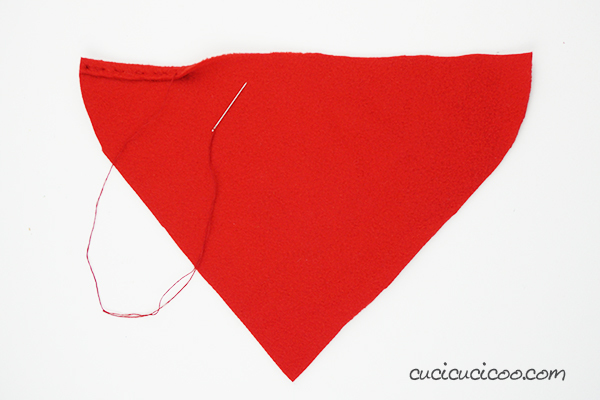 Fold the flat edge of the pocket piece 1 cm (3/8″) towards the wrong side and sew across it with a running stitch. 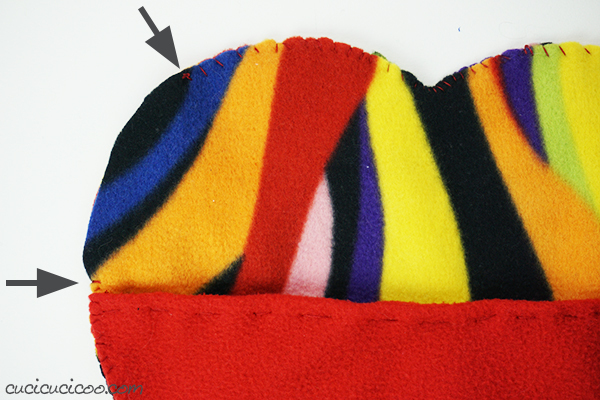 Make sure that you sew through all three layers of fabric when working through the bottom part of the pillow with the pocket. I suggest leaving a decently large opening to make stuffing the pillow easier. And you’re done! 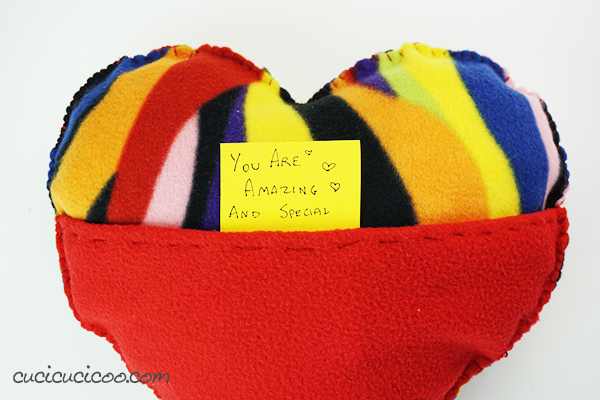 The only thing left to do is to decide who to give your hand sewn plush heart pillow to and write him or her a little note expressing how much you care! I love the message that Sofia wrote in hers! I decided to use some fancier fabrics left over from my Sea Snuggler Mermaid Tail Blankets, however they fray, so I couldn’t leave the edges exposed. So I decided to use my sewing machine and keep all edges inside the pillow. Here’s how. Prepare the pieces as with the hand-sewn version and sew the top of the pocket by machine. See? Wasn’t that easy? 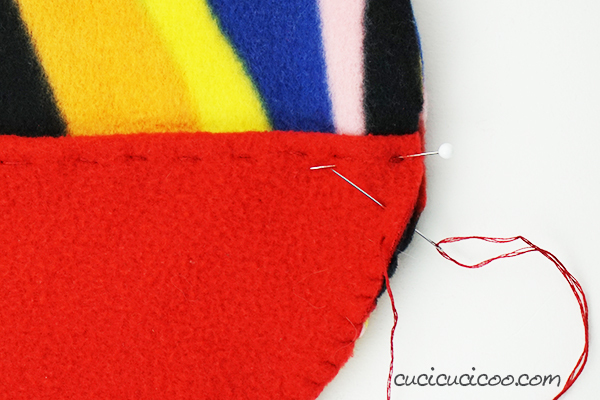 This method leaves very finished edges and is only slightly more complicated than the hand-sewn version. 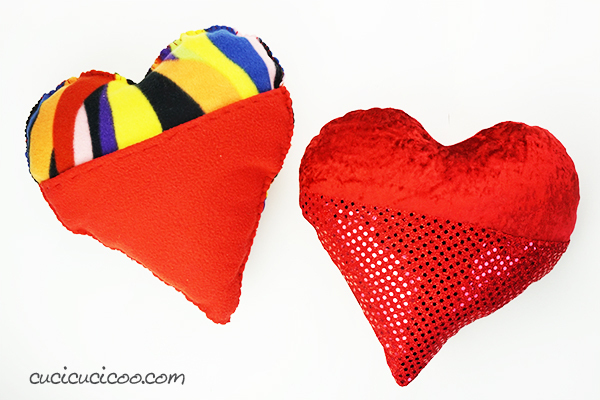 But either the hand sewn plush heart pillow or the machine sewn one is perfect for giving to someone you care about! Especially when you put a heartfelt message inside! If you want to share the love of sewing with a child while celebrating kindness, head on over to the Sew a Softie Facebook page for more information, or join the Global Kids Sewing Party Facebook event to share your projects! Tag any photos you share on social media with the hashtags #sewasoftie and #CMACIVICKIDS as all photos will be featured in the Museum’s online exhibition and on the Sew a Softie Instagram page. 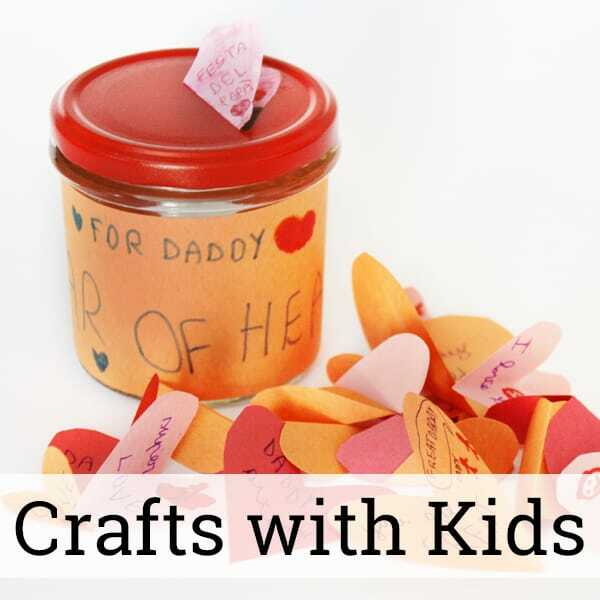 If you love creating with children, make sure you check out all the posts in my “Crafts with Kids” section! There are lots of wonderful ideas for bring out the best of your child’s imagination in many creative ways! 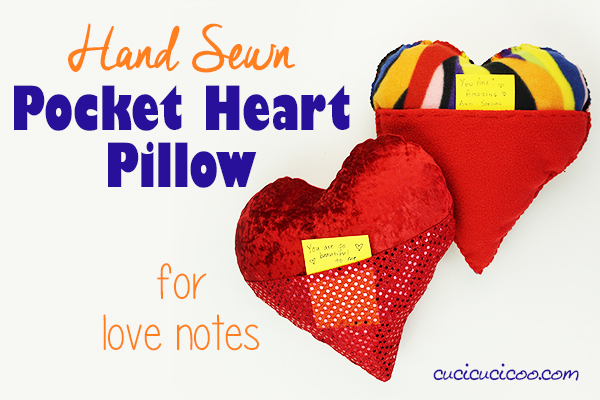 Don’t forget to sign up for the Cucicucicoo Newsletter here for access to tons of free creative supplies, including this hand sewn plush heart pillow pattern! The Newsletter is sent out every other week with lots of great ideas and links to a different free sewing pattern every week! 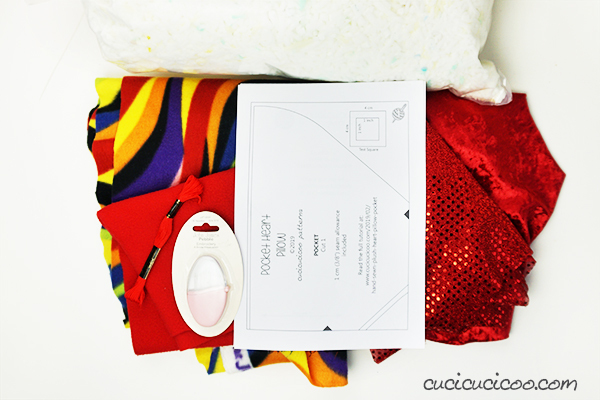 And, of course, make sure you click here to save this fun kid-friendly sewing tutorial on Pinterest! 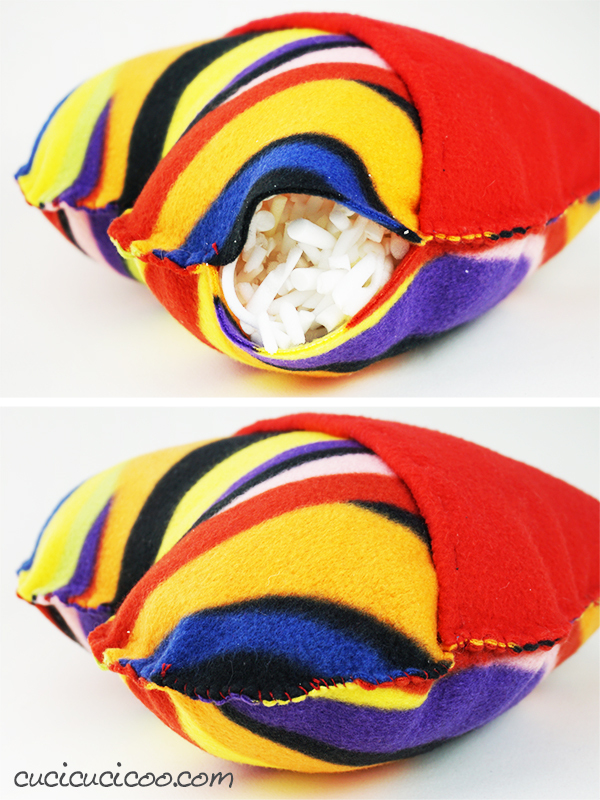 Next article8 Easy Homemade Recycled Cat Toys in under 5 Minutes!